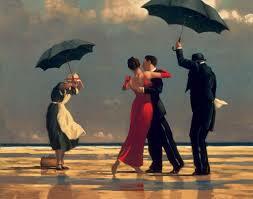 Dubbed the ‘people’s painter’, Jack Vettriano has an undeniable, instantly recognisable style. Famous as the creator of one of the most iconic contemporary images ever, which has been reproduced in almost every form imaginable. Jack is hugely popular at Collectors Prints and all over the world! Jack was born in Fife, Scotland in 1951. He grew up in a small miners cottage with his older brother, mother and father. Money was tight for the family, and Jack recalls hand me downs and skipping school to take on small jobs to help out financially. At the age of 17 he left education to become a mining engineer. Entirely self taught, Jack learnt to paint after his then girlfriend gifted him a set of watercolours for his 21st birthday. In 1989 he had reached a level of proficiency that saw him submit two paintings to the Royal Scottish Academy’s annual exhibition, not only were they accepted, but both had sold by the next day. The following year he submitted a further three works to the Summer Exhibition at London’s Royal Academy, and the rest, as they say, is history! Jack’s imagery is well known for it’s sense of melancholy, a feeling of wistfulness and nostalgia that runs through his work. ‘For some reason I have always been drawn to people, particularly women, whose hearts have been broken – occasionally by me’ Jack Vettriano. 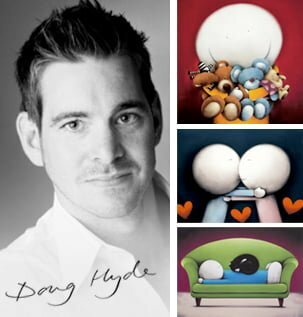 There is an undeniable autobiographical flavour to much of his work, his character saturating the canvas. He often chooses to portray himself within his paintings, sometimes literally, sometimes as the watchful gaze upon the scene in front of him. ‘I am my own leading man. And it’s a position I’m reluctant to give up.’ Jack Vettriano. Subjects are chosen for personal meaning, but Jack admits to preferring his more sensual paintings over some of the more popular and highly reproduced images. Finished paintings are usually reproduced from photographs. (Jack uses an old Kodak Brownie and admits to not yet becoming ‘digitalised’). The backgrounds to his scenes are usually added later and rarely are they original to the figures in the scene, often just a figment of his imagination. Most work is undertaken in the mornings, with Jack often already at his easel by 5.15am! Constant companions to his working day are his musical loves, (Leonard Cohen, Bob Dylan, Joni Mitchell). Other essentials are his cigarettes and a ready supply of coffee. Working and living space are both provided by his small studio in Knightsbridge, London, which he has owned for the last 11 years. But Jack also enjoys homes in Kirkcaldy, Scotland and Nice, France. In 2015 Jack was forced to take an eight month break from his beloved painting after a bad fall at his home in Edinburgh. After tripping over his bag on the stairs in the middle of the night he dislocated his shoulder and injured his wrist. He describes a lingering depression after the accident that led him to contemplate giving up his art altogether. But happily he is now returned to his brushes after extensive physiotherapy. Jack is best known for his 1992 painting The Singing Butler, which became one of the iconic images of the 90’s and is one of the most recognisable paintings in the world. The Singing Butler sold at Sotheby’s in 2004 for almost £750,000! (It had previously been sold by Jack years earlier for just £3000). Also in 2004, Jack received an OBE for services to the visual arts. To mark 20 years of his career, Kelvingrove Art Gallery & Museum, Glasgow, held a major retrospective of his work in 2013/2014. Well known collectors of his work include Sir Alex Ferguson and Jack Nicholson. 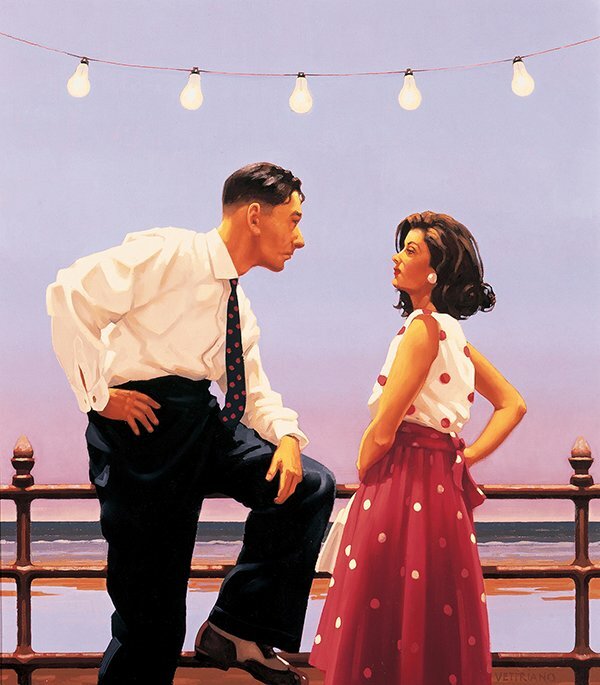 Now publishing from his own company (Jack Vettriano Publishing Company) since 2015, Jack continues to delight with his much loved images all over the globe. Celebrity sitters and sell out tours…. Famous subjects include Zara Phillips and Sir Jackie Stewart. The former being painted for charity as part of Sport Relief, and it’s creation broadcast as part of a documentary in 2008. More recently Jack was commissioned to paint Billy Connolly to mark the occasion of his 75th birthday! The portrait will be on display in Glasgow from the middle of June 2017. Jack has enjoyed phenomenal worldwide success and his sell out shows across the globe include; London, New York, Edinburgh and Hong Kong. His own self-portrait ‘The Weight’ is now on long term display in the Scottish National Portrait Gallery in Edinburgh. We are absolutely thrilled to be able to present Jack’s work to a wider audience here at Collectors Prints, Please Check out his new and previous releases on our site today!